For those of you who still think tacos look like this, there’s literary aid coming your way. Mexican editor Déborah Holtz last night was in Manhattan, presenting La Tacopedia, the result of a five-year taco research documenting everything you’ll ever need to know about tacos: From their origin and their different species, to the brave men and women who make them. “We wanted to make a book that smelled of tacos,” said Holtz, whose book includes -what else?- the recipe for 36 delicious super salsas. 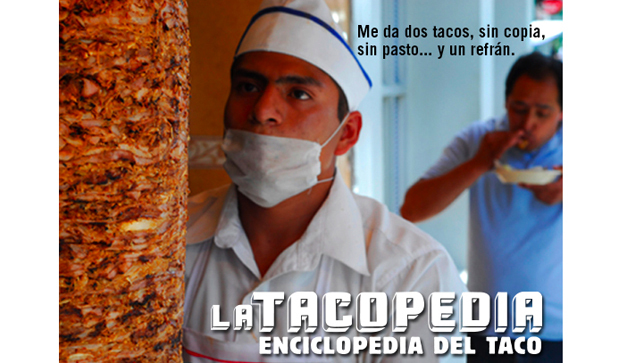 Unfortunately, La Tacopedia is currently available only in Spanish, but this blogger is one crafty freelancer and has decided to stalk Ms. Holtz until she gives me the green light to translate this jewel into English. This entry was posted in Food, Latin America, Mexico and tagged BEA, deborah holz, Manhattan, tacopedia, tacos. Bookmark the permalink. I guess I could just stare at the awesome pictures and guess the words for now 🙂 Thanks for sharing. If you ever want to read some funny and inspirational stories, you are more than welcome to come by my blog and have a Cup of Joe.